Burgundy’s Comtes de Vogüé has long been one of my favorite producers, although I find the wines often stubbornly slow in reaching their optimal drinking phase. 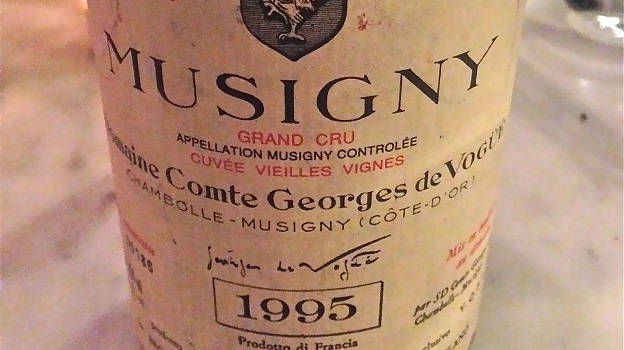 The 1995 Musigny (or at least, this specific bottle) is a case in point: very reticent upon opening, with subdued black fruit aromas and flavors, it is most expressive today on the finish, where the flavors are mesmerizingly mineral and very precise. The limestone soils really shine through here! After about 20 minutes in the glass, the wine opens up slightly, offering a bit more fleshy fruit and hints of orange peel and cocoa, but this leaves me with an overall impression of austerity, in keeping with the ‘95 vintage. Although I doubt it will improve further, this still relatively young Musigny will drink well for another 15 years. 91/Drinking window: 2014-2029.